From his broad city plans and architecture to his detailed furniture and silverware designs, Eliel Saarinen sought balance between geometry and nature. 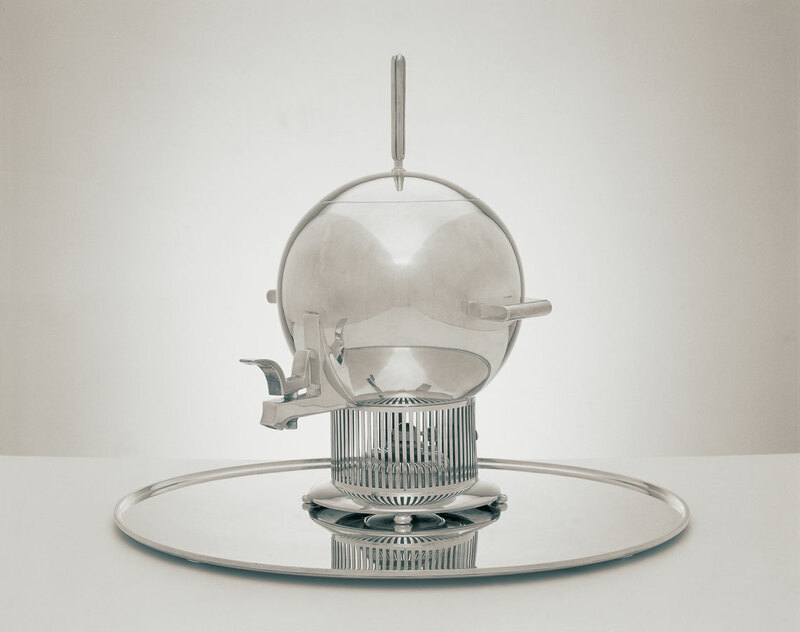 His spherical tea urn with flat handles and round tray embodies futuristic design elements that helped define the Machine Age while its spire finial and linear spout reference nature. The urn is unique within a limited series manufactured for use at Cranbrook. This series includes two documented examples with ebony handles and lid inserts (still in the collection of Cranbrook Schools) and Saarinen’s personal urn, matching creamer and sugar bowl, plated in brass with Bakelite inserts (now in the collection of The Metropolitan Museum of Art). Another version designed for mass production with wider slats and no bun feet appeared in Room for a Lady, “Contemporary American Industrial Arts” at The Metropolitan Museum of Art in 1934, and again in the “Exhibition of Home Furnishings” at the Cranbrook Pavilion in 1935. Retailing at $80 for the urn and $30 for the tray, few were manufactured. It nonetheless appeared in numerous subsequent exhibitions and publications and inspired many prominent industrial designers.